The Senator Ahmed Makarfi-led Peoples’ Democratic Party (PDP) has said it has no problem with the spate of secessionist agitations and counter-agitations ignited by the leader of the Indigenous People of Biafra (IPOB), Nnamdi Kanu; stressing, however, that the manner in which they are going about it is wrong. This was made known in Abuja at a press conference addressed by Senator Ahmed Makarfi, on Wednesday. 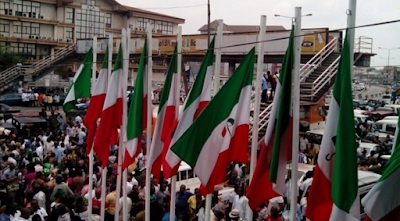 According to the PDP, agitations give room for people to express their grievances and call for the redress of such, adding that it is a vital ingredient that sustains democracy and the rule of law. The leading opposition Party in the country, however, appealed to Nigerians to show respect for one another and to demonstrate a realization that individual rights and freedom does not include encroachment into, and infringement on the legitimate rights and dignity of others. 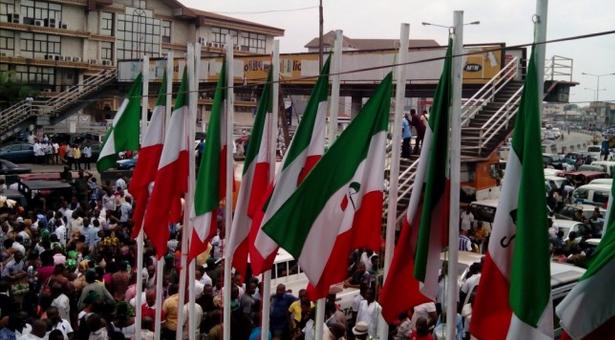 The Party condemned the recent altercation between some Nigerians from the Northern and South-Eastern regions which degenerated into the issuance of ultimatum and counter ultimatum for some members of specific ethnic nationalities to vacate certain areas; adding that it portends ill wind that blows no good. It also commended the Acting President, Yemi Osinbajo, for the steps he has so far taken to douse the tension occasioned by the altercation, but called on all government to build on the effort by ensuring that its programmes, policies and steps are tailored in such a way and manner that no section of this country is given the impression that it does not count. Makarfi said: “By far the most worrisome of all the challenges to confront us recently are not the agitations and counter agitations that have been occupying our space but the manner in which they are being made. “The PDP believes that in any democratic space, allowance must be made for people to express grievances and agitate for the redress of such; this is a vital ingredient that sustains democracy and the rule of law. “This was why while in power, the Party never shied away from providing Platforms and fora for the expression and dissipation of feelings, however strong, with a view to finding common grounds among our people. “You would recall that it was a PDP government that convoked a Political Reform Conference in 2005, where an opportunity was afforded Nigerians to take a look at issues that were then considered important enough for us to deliberate on. “It might not have resolved all our problems because no single conference can, but it was certainly a veritable vehicle that not only injected fresh air into our political space, but its recommendations substantially formed the kernel of the constitutional amendment processes that were later conducted. “Similarly, when in 2014 new agitations emerged, the PDP did not fall for the convenience of sweeping them under the carpet; our government then convoked yet another National Conference at which issues of concern and interest to Nigerians were tabled, deliberated upon and even far reaching recommendations made by representatives. “We couldn’t go any distance with implementing the recommendations made for the obvious reason that we lost the reins of power in the 2015 elections. It is however gratifying to note that the current Senate has requested the Executive arm to resubmit the Report of the 2014 Conference for further action. It is our hope that this will be used to accelerate the process of further cementing the unity and functionality of Nigeria. “Nigeria as a federation has come a long way and it is our duty as individuals and a whole to ensure that it endures; and indeed surpasses the dreams of our founding fathers. Every step we take must be, as the Americans would say, ‘towards a more perfect union’. “We are therefore free, to at any point in time take a look at the structures of the union, not its basis, and effect whatever corrections we collectively agree are necessary. It is in this context that we view calls from some quarters for the restructuring of our own concept and practice of federalism. “It is not in dispute that the incursion of the military into political governance from mid-1960’s all but eroded the very essence of federalism as was practiced pre and immediate post independence, to largely service the command structure of the military, and along the line even democratic administrations have had to make do with the military imposed structure due, largely to the fact that such democratic dispensations, including ours have had to govern by the dictates of constitutions promulgated by the military institution which is basically unitary by nature. “Whatever is agreed upon however, it is our belief that it will not take us to the Promised Land as long as we don’t have strong institutions that serve the state not the whims and interests of those in charge at any given time. “We, for example need institutions like armed forces and security agencies to operate on the premise of loyalty to the Nation rather than loyalty to the President, Governor or whatever nomenclature the Chief Executive is given. This should not look like a novel idea because we see it happening everyday around the world in countries that have built strong institutions that are the bastions of their democratic structures. “This Country belongs to all of us, and every one of us must be allowed to enjoy the constitutional guarantee of freedom to live and move about this vast God-blessed land without let or hindrance to pursue his or her legitimate endeavours. “But I reiterate that mutual respect and accommodation are a very necessary ingredient. We have had that before; we still have that and must not allow it to elude us. “We must also ensure that we have a better legacy to upcoming generations than the one bequeathed to us, and not worse. This is the way decent societies are built and developed by each generation building on the blocks laid by its predecessor(s), not destroying what they found in place. “There’s no harm however in trying to improve upon an existing structure. “It is in view of this that the PDP wishes to acknowledge the efforts of rational national leaders across board for weighing in on the side of restraint and the imperative of peaceful coexistence. “The Acting President, Professor Yemi Osinbajo deserves commendation for the steps he has so far taken to douse the tension occasioned by the altercation, but we call on all government to build on that by ensuring that it’s programmes, policies and steps are tailored in such a way and manner that no section of this country is given the impression that it doesn’t count. “Let me reiterate the belief of the PDP in the unity of this country as well as its unwavering commitment towards the attainment of its manifest destiny as a country of pride to the entire black race.